It’s the February 4th, 2017. Kendrick Ball Jr swaggers to the ring. Awaiting him is Massachusetts prospect, Patrick Leal. The opening bell goes and Ball advances straight towards him, immediately catching him with a jab. Leal starts backing up, desperately swerving Ball’s bombardment of punches. It isn’t long before Ball catches him with a body shot. Leal drops to the canvas, clearly in some discomfort. After just 27 seconds of round 1, the referee stops the fight. The demolition that just occurred makes it clear to everyone in the room that Kendrick Ball Jr can go all the way. Ball turned pro last year, signing with promoter Jimmy Burchfield and Classic Entertainment Sports. 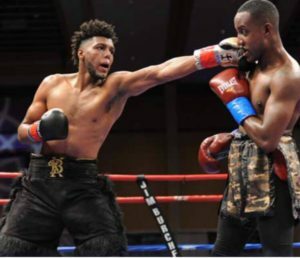 Ever since he watched his friend and fellow pro boxer, Khiary Gray, sign with CES and have great success, he knew that it was the promotional company for him. Despite signing with Burchfield and CES, he is still desperate to prove he is worth the investment, “I want to work harder and show CES that I have more to bring to the table than they have seen in my 3 fights so far” says Ball. Since turning pro, he has moved quickly through his first 9 fights and remains undefeated with 7 wins, 5 of which came by way of knockout. Most recently, Ball won a unanimous decision against Godson Noel on the 9th of June at the Twin River Events Center. “That was my biggest accomplishment so far as a pro” said the 24 year old. “My other tough fights I had against undefeated guys were draws” he says, “beating a guy who was 6-0 was a great feeling”. Kendrick Ball Sr was always wanted his son, Kendrick Ball Jr, to get into boxing and so started him early. He began by working him out on the mitts around their house. Soon enough a young Kendrick Ball Jr was sparring at the local Worcester boys and girls club. Ball’s amateur career got off to a slow start, losing his first nine fights. It was perhaps hard to see the unbeaten professional fighter that would eventually be sculpted out. Clearly, Ball needed to significantly increase how much he was training. Some additional conditioning was all that was required to reveal Ball’s underlying talent and he went from strength to strength during the last two years of his amateur career. He quickly became one of the most promising amateurs in New England, winning the Rocky Marciano tournament as well as New England’s and Western Mass Golden Gloves. A narrow defeat to the Olympic alternate was evidence enough that Ball had strong prospects in the professional ranks. Kendrick Ball Jr is newly emerged onto the pro scene, but he’s here to stay. For now, he is just focused on improving “I’m a hard working fighter that just wants to get better” he says modestly. But sooner or later, if you carry on improving and improving, you find yourself at the top. Ball is very open about his goals, “my ultimate goal is to work my way up and grab a world title while I’m there” he says. A graduate of Worcester Technical High School, Ball knows how much the next generation matters. The allure of the money and fame that comes with the fight game is appealing but, Ball recognizes the importance of giving back saying “I just want to be a role model for the upcoming fighters and kids”. Kendrick Ball Jr hasn’t been pro for very long, but he has already made a significant impact. He’s has a great training set up and is being managed by one of the best promotional teams in the United States. He’s fast, he’s flashy, he’s powerful, he’s marketable, he oozes potential and he is just getting started. Ball’s next fight is penciled in for September 16th this year with the opponent currently being unknown. The boxing fans of Worcester surely can’t help but ponder the potential stardom of Ball. He is has world champion written all over him and undoubtedly one day he can bring a world championship strap back to his hometown.